Q: The names of which pair of Shakespearean characters appear on the astronomer Tycho Brahe's coat of arms - in the list of his ancestors? Saturn and Venus in conjunction! - Henry IV, Part Two. Rosenkrantz and Guildenstern. By a bizarre coincidence, I was just talking about this on usenet with someone who's looking into medieval and renaissance Scandinavia for a story she's writing. Shakespeare's characters are assumed to have been based on Frederick Rosenkrantz and Knud Gyldenstierne, who were present on an embassy to England in 1592, and were respectively Tycho's third cousin and some other sort of cousin. The Rosenkrantz and Gyldenstierne families were major players in Denmark's aristocracy over several generations, as were the Brahe family and the Bille family (Tycho's mother's family). And, in the words of my usenet interlocutor, "the nobility married amongst themselves a lot." She also pointed me to this genealogy. The astronomer is not the Tyge at the top but the one directly under him two generations later. Kitty Ferguson, Tycho and Kepler, Headline Book Publishing, 2002.
which talks about Rosenkrantz and Gyldenstierne on pp. 261-2. Eric Altschler, Searching for Shakespeare in the Stars. 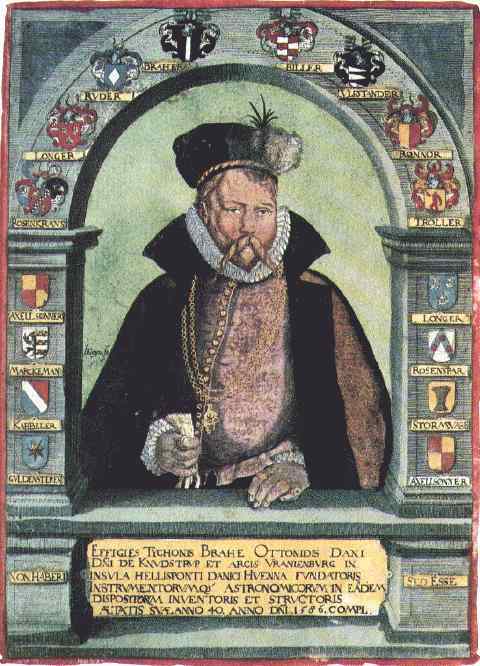 Numericana.com, Coat-of-arms of Tycho Brahe (1546-1601), in Escutcheons of Science. Tim Silverman posted his information at the n-Category Café.